Focusing on the language, style, and poetry of Dickens? novels, this study breaks new ground in reading Dickens? novels as a unique form of poetry. Dickens? writing disallows the statement of single unambiguous truths and shows unconscious processes burrowing within language, disrupting received ideas and modes of living. 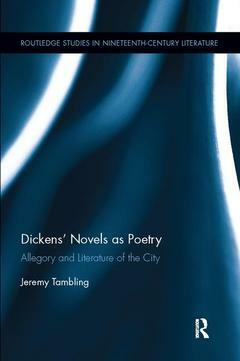 Arguing that Dickens, within nineteenth-century modernity, sees language as always double, Tambling draws on a wide range of Victorian texts and current critical theory to explore Dickens? interest in literature and popular song, and what happens in jokes, in caricature, in word-play and punning, and in naming. Working from Dickens? earliest writings to the latest, deftly combining theory with close analysis of texts, the book examines Dickens? key novels, such as Pickwick Papers, Martin Chuzzlewit, Dombey and Son, Bleak House, Little Dorrit, Great Expectations, and Our Mutual Friend. It considers Dickens as constructing an urban poetry, alert to language coming from sources beyond the individual, and relating that to the dream-life of characters, who both can and cannot awake to fuller, different consciousness. Drawing on Walter Benjamin, Lacan, and Derrida, Tambling shows how Dickens writes a new and comic poetry of the city, and that the language constitutes an unconscious and secret autobiography. This volume takes Dickens scholarship in exciting new directions and will be of interest to all readers of nineteenth-century literary and cultural studies, and more widely, to all readers of literature.